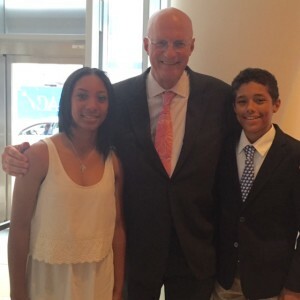 Dr. Meyers with Mo’ne Davis and Scott Bandura at the Up2Us Sports annual gala at the IAC Building in New York. Congrats to Mo’ne and Anderson Monarch’s coach Steve Bandura for being honored with their Up2Us Sports Legacy Award! They are a great example of what a positive player-coach relationship can do, both on and off the field. We were honored to sponsor the Anderson Monarch’s Barnstorming Tour in 2012 when we first met Steve, Mo’ne and the rest of the amazing team of coaches and kids.